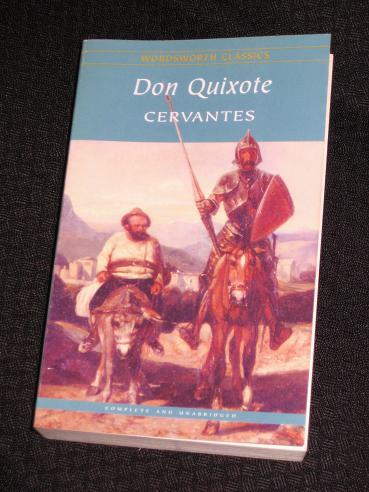 Miguel de Cervantes’ Don Quixote is a monster of a book, around 800 pages in my Wordsworth Editions version, but nearer 1000 in other versions I’ve seen. Despite its size, however, it’s actually a very accessible book, less a densely-plotted novel than a continuous series of stories held together by the seemingly-insane adventures of our titular hero, Don Quixote de la Mancha, the Knight of the Woeful Figure/Lions. A satire on improbable contemporary novels of knights-errant, Cervantes’ book is a funny, page-turning work, one which can be recommended to any reader. Our hero is a modest, relatively well-off man whose brains, after decades of reading sixteenth-century pulp-fiction, become so addled that he actually believes all the improbable events he reads about. Eventually, he decides that his life is worthless unless he does his duty to the world in becoming a knight-errant, a wandering righter of wrongs. Therefore, dressed in ancient and dubious armour, he sets off armed with a sword and his love for the semi-imaginary Dulcinea del Toboso (in reality, a peasant woman he has never met…), supported, initially at least, only by his trusty steed Rozinante. The legendary tilting at windmills is one of the first of Quixote’s madcap antics, but his noble attack on the army of sheep is another which sticks in the memory. The poor man is completely delusional and sees enchanters and giants everywhere he goes, each traveller he comes across a potential supplicant – or enemy. It’s little wonder that Sancho appears to lose it himself before long, believing his master will eventually become an emperor and grant him his own island. That could never happen – could it? The windmill episode is the only thing I know about the book, courtesy of Nik Kershaw's song. My dad has had a copy of it for a few years, he told me it was supposedly a good read, and I've been considering pinching it from him. I think it's the Penguin version. 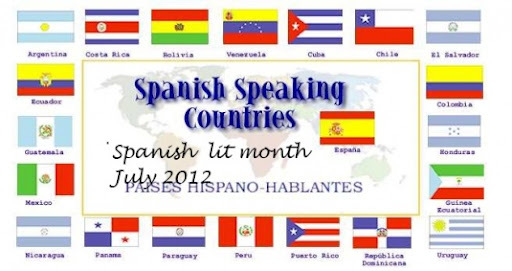 “Decreed” July to be Spanish Lit Month? Whoa, I kind of like the sound of that! Rollicking summary here and one which makes me glad I'll be revisiting the book this month sometime. Esp. love the fact that you found DQ so entertaining even in a “worse than worthless” translation…guess I need to read Wikipedia more–that's my kind of writing! I've read the first part (Jarvis translation), but never quite managed the second part–this is the second time I've heard the second part's better, too, so I really have no excuses! One of these days when I have some spare time I'll have to pick it up again–I'm quite sure I couldn't manage it all for Spanish lit month!. It's my favorite book of last year. Took me some half year of episodic reading. I loved the Rutherford translation I read it in. But it's one of the books that survives any bad translation, at least according to Bolaño.